Add a little gleam to your holiday or candlelight table with some gorgeously decorated candles. You do not have to buy any expensive readymade embellished candle as you can decorate them yourself at home. You might be thinking of numerous candle decoration ideas but beautifying them with colorful buttons is a unique idea. It adds festive touch to your house’s overall decoration. Additionally, they are inexpensive and so easy to try at home. Decoration of candle with buttons is a perfect activity for art enthusiasts on a budget who want to display some fun but creative decorations! The best thing about this activity is you can involve your children in it as well. It is a fun idea to engage them. Place your favorite button on a smooth surface with the face side down. Now apply some hot-melt adhesive to the center of the button, using a hot glue gun. 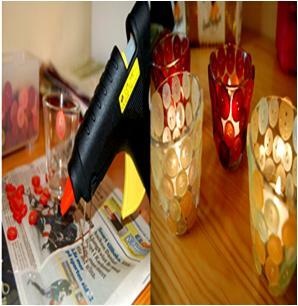 Quickly add the buttons to the diameter of the candle and hold for few seconds until attach thoroughly. Glue and apply one button at a time. Enjoy! Place a piece of thread on a smooth surface. Use a hot glue gun to apply some hot-melt adhesive to the back side of the selected buttons and add them to the thread in a line, keeping some distance in between. Wait until the adhesive dries well. Now, add the threaded buttons along the diameter of your candles, according to your desired pattern. You can apply in a zigzag, swirl and circle etc. Place some old newspapers on the floor to create your work surface. Pick the buttons one by one and apply some adhesive to their backside, using a hot glue gun. Without wasting time, quickly place the glued buttons on the outer side of the candle holder and hold it for few seconds until it attaches to it properly. You can arrange the buttons randomly or any pattern that you like. Place the candles inside the holders and enjoy!